People with obstructive sleep apnea may not be aware that their sleep was interrupted. In fact, some people with sleep apnea think they sleep well all night. Excess weight. People who are obese (BMI greater than 30) have four times the risk of sleep apnea that people who are a normal weight people do. Fat deposits around your upper airway may obstruct your breathing. But not everyone who has sleep apnea is overweight. Neck circumference. People with thicker necks may have narrower airways. For men, the risk increases if neck circumference is 17 inches or larger. In women, the risk increases if neck circumference is 15 inches or larger. Daytime fatigue. The repeated awakenings associated with sleep apnea make normal, restorative sleep impossible. People with sleep apnea often experience severe daytime drowsiness, fatigue and irritability. You may have difficulty concentrating and find yourself falling asleep at work, while watching TV or even when driving. People with sleep apnea have an increased risk of motor vehicle and workplace accidents. You may also feel quick tempered, moody or depressed. Children and adolescents with sleep apnea may do poorly in school or have behavior problems. High blood pressure or heart problems. Sudden drops in blood oxygen levels that occur during sleep apnea increase blood pressure and strain the cardiovascular system. If you have obstructive sleep apnea, your risk of high blood pressure (hypertension) is greater than if you don't. Obstructive sleep apnea may increase the risk of recurrent heart attack, and abnormal heartbeats, such as atrial fibrillation. 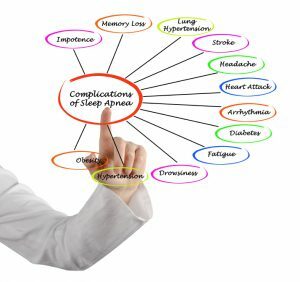 Obstructive sleep apnea also increases the risk of stroke. If there's underlying heart disease, these multiple episodes of low blood oxygen (hypoxia or hypoxemia) can lead to sudden death from an irregular heartbeat. Sleep-deprived partners. Loud snoring can keep those around you from getting good rest and eventually disrupt your relationships. It's not uncommon for a partner to go to another room, or even on another floor of the house, to be able to sleep. Many bed partners of people who snore may be sleep-deprived as well and have a higher chance of developing Type 2 diabetes themselves.